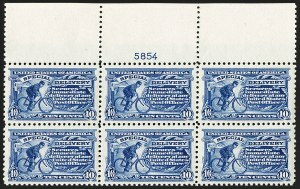 The second Special Delivery stamp, Scott E2, was made from two plates--numbered 552 and 73. Plate 552 was made first and was numbered in the series of 1882; Plate 73 was numbered in the series of 1890. There are perhaps ten known of the 1888 Issue, Scott E2, of which about half come from top positions. 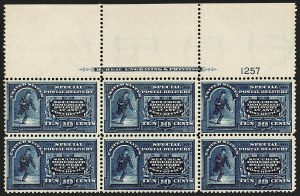 The same plates were used to print the Orange Special Delivery issue, Scott E3, which was issued in conjunction with the 1893 Columbian Issue. The plate block offered here is one of the finest we have ever encountered. There are perhaps a dozen plate blocks known of the 1893 Issue, Scott E3, which is an extension of the Columbian Issue commemoratives. Two plates were used to print this issue--the same two plates that were used to print Scott E2. Our informal survey of the records of The Philatelic Foundation and auction catalogues found ten, plus two contained in a pane which may no longer be intact. The plate block offered here is one of only two we could find from the bottom right position of Plate 552. 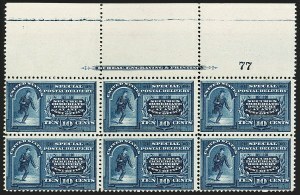 There are perhaps a dozen plate blocks known of the 1894 Issue, E4. Only one plate number was used for this issue--Plate 77. This was issued concurrently with the 1894 Unwatermarked Bureau Issue (Scott 245-263). The difficulties experienced by the Bureau of Engraving and Printing during their early attempts at producing postage stamps are well known to collectors. Poor centering and numerous unpunched perforations are the norm for this issue. Our informal survey of the records of The Philatelic Foundation and auction catalogues found ten plate blocks. Only one other is in Mint N.H. condition; it also has wide selvage, but the perforations touch the design on the bottom stamps. 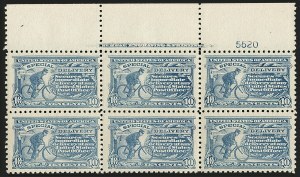 Only stamps from Plate 882 show the dots in frame that are found on the earlier American Bank Note Co. stamps (Scott E1-E3). The Bureau of Engraving and Printing removed the dots from the transfer rolls used to make the Special Delivery plates, except for Plate 882, which was made from a transfer roll with the dots left intact. This is one of only two plate blocks from this plate we have been able to locate with assistance from Lewis Kaufman. This plate block is extremely rare in Mint N.H. condition. 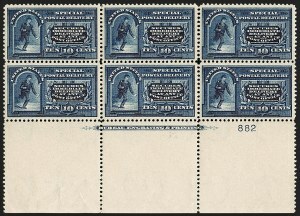 This is the first Mint N.H. plate block we have offered since keeping computerized records, and The Philatelic Foundation has never certified one. 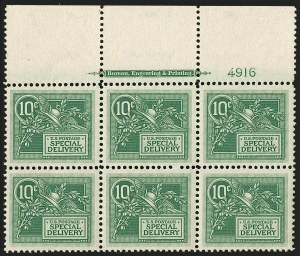 The 1917 Perf 11 Unwatermarked Special Delivery stamps were printed from plates with and without the Bureau Type VII imprint. Plate blocks with the imprint and plate number are much scarcer than those with just the number.